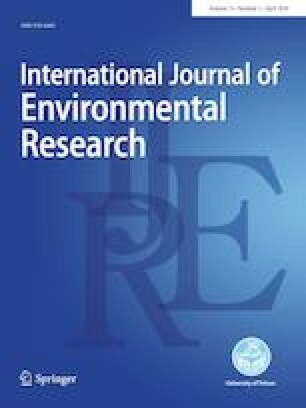 The present study aims at evaluating the potential of synthesized biosorbents using NaOH-activated dead leaves of Ficus racemosa (NTFR) and Prunus dulcis (NTPD) for the treatment of real industrial effluents containing dyes. Kinetic and isotherm studies have been performed to establish the important design-related information for the treatment of industrial effluent using synthesized biosorbents. The extent of dye removal obtained as 99.19% for the studies involving pure dye solution of Acid Blue 25 dye with 50 mg L−1 as initial concentration using NTFR biosorbent was found to decrease marginally to 96.72% in the case of real effluent with similar dye loading and under similar operating conditions. Biosorption capacity for the case of pure Acid Blue 25 dye solution obtained as 83.33 mg g−1 also marginally decreased to 80.65 mg g−1 for the industrial effluent. Similarly, for the case of Acid Green 25 dye, extent of dye removal obtained as 92.09% was found to decrease to 84.51% in the case of mixed industrial effluent. In this case, reduction in chemical oxygen demand (COD) was also measured and compared with that of pure Acid Green 25 dye solution. COD reduction was obtained as 53.97% at the optimized dose of 18 g/L of NTPD for mixed industrial effluent which was lower than 92.05% obtained at the optimized biosorbent dose for pure Acid Green 25 dye solution. Langmuir and pseudo-second-order model fitted well to the obtained data in the present study. The obtained results confirmed potential of synthesized biosorbents for removal of dyes from industrial effluent and also established the influence of other compounds present in the industrial effluent on removal rate of individual dyes. Novel biosorbents applied for treatment of real dye-containing industrial effluent. Comparison of removal rates for real effluent and simulated solutions. Kinetic and adsorption isotherm fitting to the obtained experimental data. COD reduction analysis confirmed the interaction of other compounds on dye removal. Lower dye removal observed for real effluent as against simulated effluents. The authors thank University Grant Commission-Networking Resource Centre at Institute of Chemical Technology, Mumbai, India and Lotus Enterprises, Mumbai.